The following WhatUsersDo review is intended to provide you with valuable information about the website. We will address exactly how the site works, what rewards it has to offer (if there are any) and go over the pros and cons of using it. In addition, this WhatUsersDo review will tackle the subject on whether or not the website is legit in the first place by going over comments from actual users. Furthermore, the following WhatUsersDo review will touch on common concerns about the website. Some of these include how slow it is to start earning on it due to its sometimes reduced number of available jobs. This and many more will be addressed in the following review. WhatUsersDo was launched back in 2008, and it is a remote user testing platform (UX). For those who are unaware, remote moderated research (or online moderated research) is similar to in-person testing. The biggest difference is that you get to gather online alongside other participants by using an audio bridge with screen-sharing technology, all of this without having to leave your home. This website holds many similarities to sites such as JivoChat. Is WhatUsersDo Legit or a Scam? Like with any similar website, the most important question to be answered in this WhatUsersDo review is whether or not this is all a big scam or if it’s all alright. To put it plainly: no, this is not a scam. 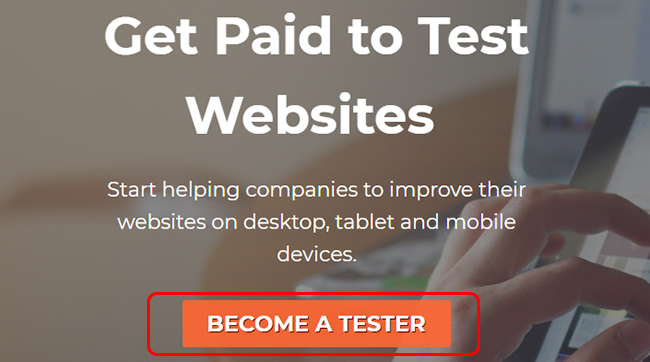 We know this simply because not only can you sign up to be a tester for free, but you do get paid for completing your work on the site. Perhaps even more importantly though is that the company uses a more than famous system, PayPal, to send you your money. Once you have found out and made sure that you meet these requirements, you can consider signing up for the website. Your screen and voice will be recorded with the screen recorder downloaded and a microphone ready at hand. Users will have to complete a variety of tasks such as browsing products on a number of different websites. In addition, you may be asked to search for a more specific web page. Users typically receive around 3 to 5 or so monthly tests to review different websites. You can receive a greater number of requests depending on the quality of your work. Tests categories include Website Benchmarking, Website Usability, and SEO Research. As long as you complete tasks, you will be compensated $5/€5/£5 for each one. The payout to your PayPal account will be done on the 25th of every month. Free to sign up: It costs nothing to become a tester for WhatUsersDo.In fact, if you already own a microphone or have one built-into your laptop or desktop, there is nothing else you need to get. 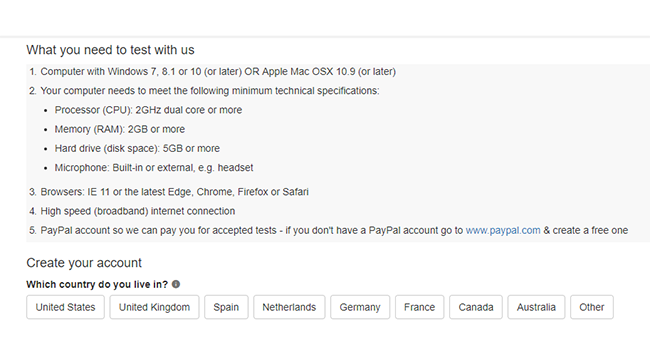 The software needed to test the websites is free to download as well. Consistent payouts: No matter what, you know you will get paid on the 25th of every month. In case something happens, or fails to take place, you can always reach out to their support team. International members: The website isn’t limited to just one or two countries. Rather, WhatUsersDo accepts members from 6+ countries, including the US, UK, and Canada. Slow start: There is little denying that it can take some time to start earning with WhatUsersDo. Not everyone is offered that much work on a monthly basis to ensure decent earnings, so this must be factored in as well. Looking at any other WhatUsersDo review out there, it is easy to tell that the most common complaint addressed is how slow it is to find work on it and set up any sort of workflow. There are well over 1,000 testers on the site, so the fact itself that finding work is hard is not too much of a surprise. In addition to that, there can be some communication problems when it comes to reaching out to the company, according to several registered users. There are some fixes you can attempt for both of the issues above. First, when it comes to not getting enough work, the best thing to do is make sure that the tasks you do get are completed to the best of your ability and as high quality as possible. The better your work, the higher your chances of receiving more. As for the communication aspect, it is best to reach out to them using all available outlets, including social media ones. Phone: You can call their London office for General Enquiries at +44 (0) 203 948 1360. Social media: WhatUsersDo has an official Twitter account and a Slack community. To wrap up this WhatUsersDo review, this UX website is free-to-join, and they only pay out in cash via PayPal. These are just two of the characteristics that make it hard for it to be viewed as a scam. It is a legitimate means of earning some extra cash, although it can take some time to actually get work. Have any of you tried to use WhatUsersDo before? Let us know in the comment section how it worked out for you. 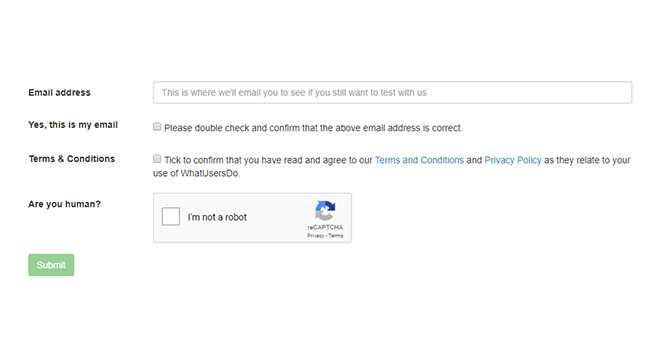 Not particularly sure that WhatUsersDo is the one for you? Then check out any of the following and take your pick!